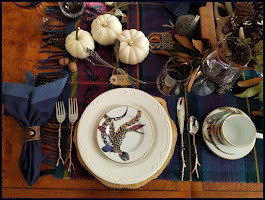 Sunflower Tablescape - Curated from My Garden! 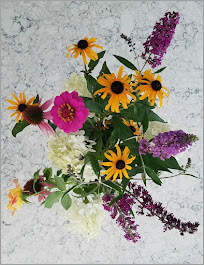 I have journaled my garden with photos and notes for the past 15 years, and out of thousands of photos taken (no lie), I probably only have 10% or so that I can get really excited about. I got a little carried away with my excitement a few weeks ago and kicked it up a notch to bring you today's tablescape of sunflowers. Much to my delight a few years ago, sunflowers (helianthus) voluntarily grew in my summer landscape beneath the feeder I fill with black oil sunflower seeds during cold weather months. For three years in a row, the patch of sunflowers grew bigger, and more varied. I captured their beauty in photos, the best of which (to me) was a profile shot of a huge sunflower, with a bee approaching. I also caught the bee on the flower, head on, the flower's petals gorgeously lit from the sun hitting it from behind, and the bee within its sweet center. Even though I didn't have any sunflower volunteers this year in my garden for whatever reason, I made my own sunflowers - in the form of these dishes you're seeing in today's tablescape! 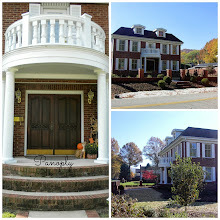 While browsing my Panoply photos one evening after uploading to my Shutterfly account (where I share my albums with my Panoply sisters), I came across a $20 off any order website sale, on top of which I was able to get free shipping. 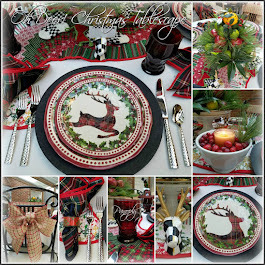 Browsing Home Decor, I found you can upload your images and create PLATES! It was 10pm, and the sale expired at midnight, so there I was, uploading photos of many varieties of my garden favorites (only one sunflower in the dozen or so I uploaded). 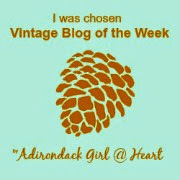 NOTE: This is NOT a paid post, and my blog is a no-income producing blog. 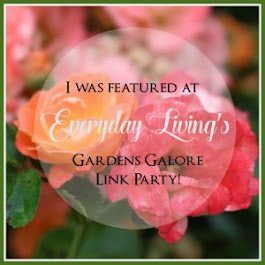 I am simply sharing an amazing experience. Just before the clock struck midnight, I ended up with just two plates - one of my bee/sunflower side view, and another favorite of mine, my hydrangeas. Mind you, these photos are each in their respective years' folders of Garden 20__ folders, where blank is the year they were taken. I was getting a little spastic, trying to figure out my favorites and pull from the hundreds within each year's folders before the midnight hour expiration. 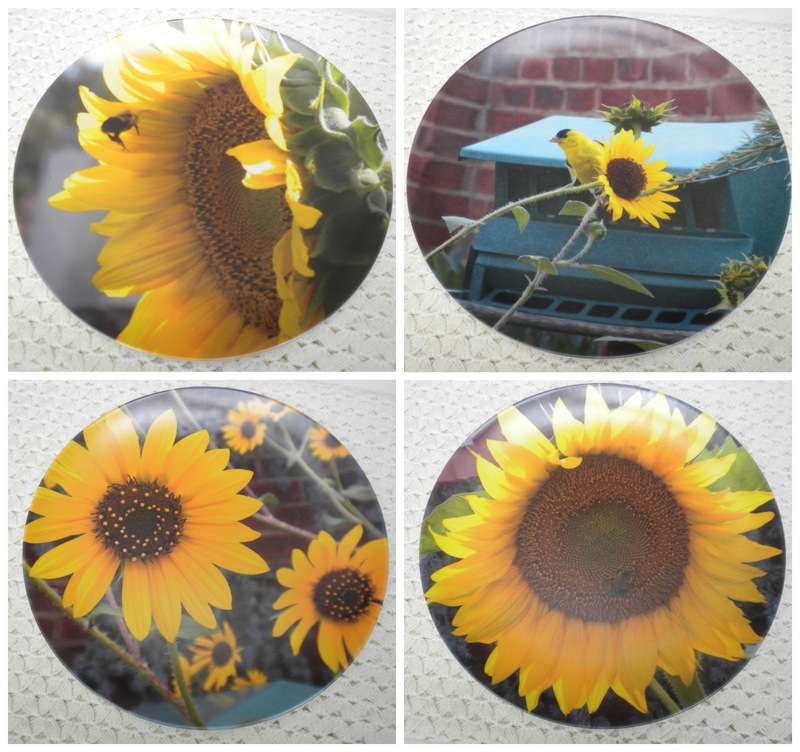 I was so excited when I received my plates, I waited for another sale - this time 50% off - and ordered enough additional plates to complete service for four in the sunflowers - all with photos I have taken in my garden. These plates are melamine, 10", and the photo quality on the plate is terrific! Shutterfly dates the back of the plate when they produce it, and each plate is a saved "project" on your Shutterfly account, should you want to call it up and use it for additional items, too many to name. Pssst....don't ever pay full price for anything on Shutterfly - they ALWAYS have deals going on, and often the discounts can be stacked (multiple discounts allowed on a single order). With my dish addiction, this could get really dangerous! I generally don't use melamine plates, but these sure were a fun find, and fun to make. 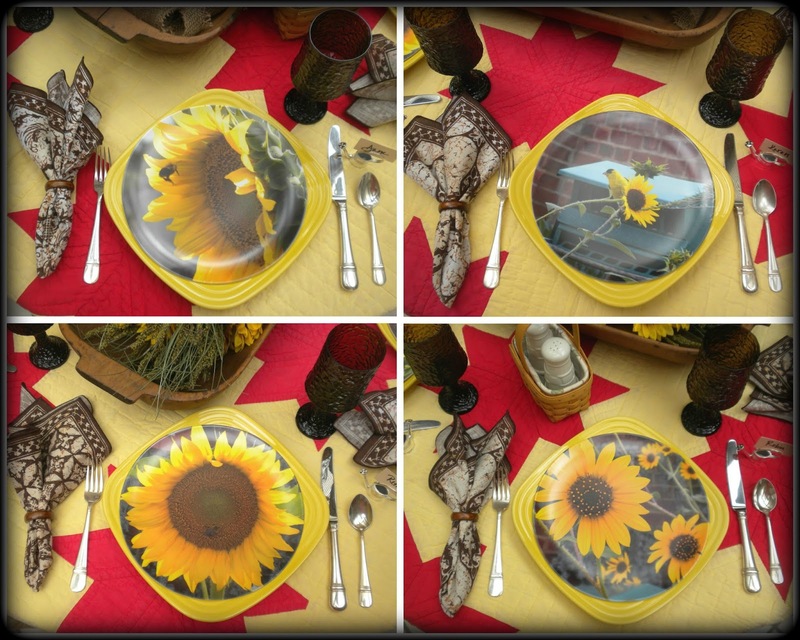 In an otherwise barren year of volunteer sunflowers in my garden, these plates make me happy. They also are a great way to memorialize my love for my garden. Thanks so much for joining me today. I appreciate your visits and comments! 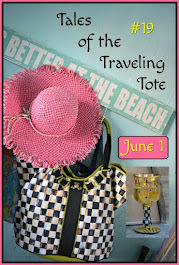 (Special thanks to Christine at Rustic & Refined for featuring this post). 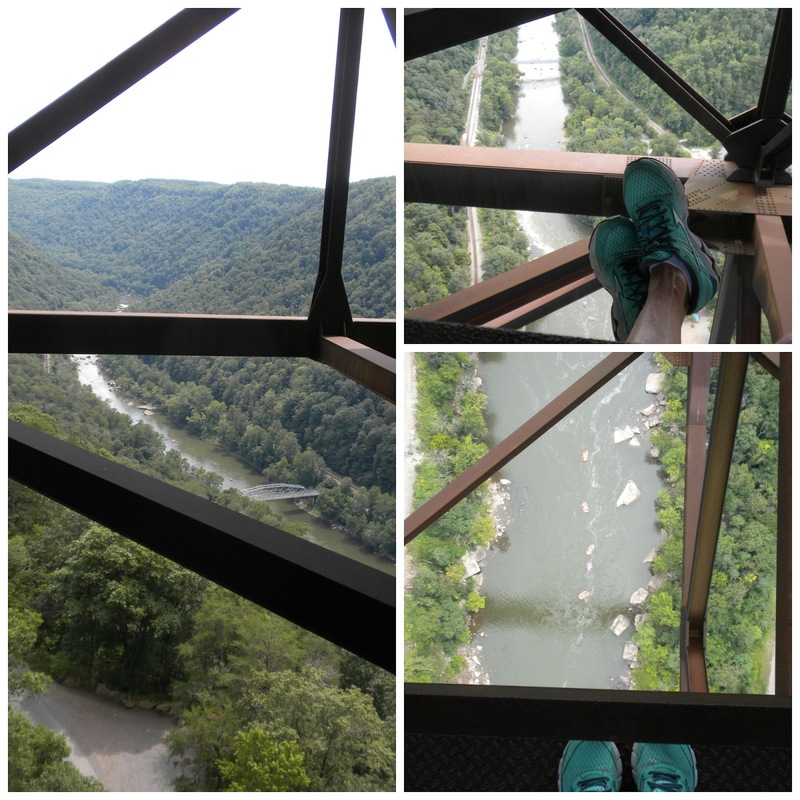 Day Trip Adventure: Bridge Crossing - by Catwalk! Mr. P. and I traveled about an hour southeast from home recently, to the sleepy little town of Fayetteville, WV, for a day's worth of outdoor fun. On our to-do list for the day: hiking the Endless Wall Trail within the bounds of the New River Gorge National Park in the morning, followed by lunch in town, and then an afternoon guided tour along the Bridgewalk - across the New River Gorge Bridge - via the catwalk beneath it! (see photo below). 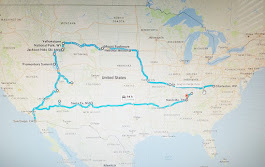 To get to this area from our home, we first traveled through country roads beginning just fifteen miles outside the capital city limits, straight into the coal fields. 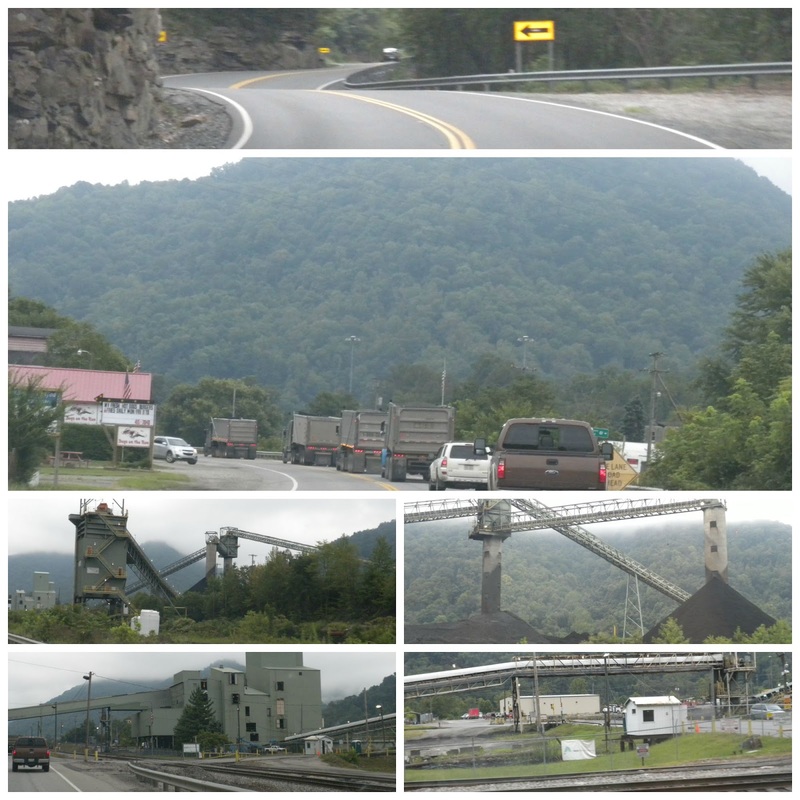 The fog was pretty thick, and coal hauling trucks had traffic backed up more than once, as they traveled to and from the mining sites and prep plants. We arrived and started our hike around 9am, and hit the trail while temps were cool. The Endless Wall trail starts out graveled, but turns to a dirt path shortly into it. 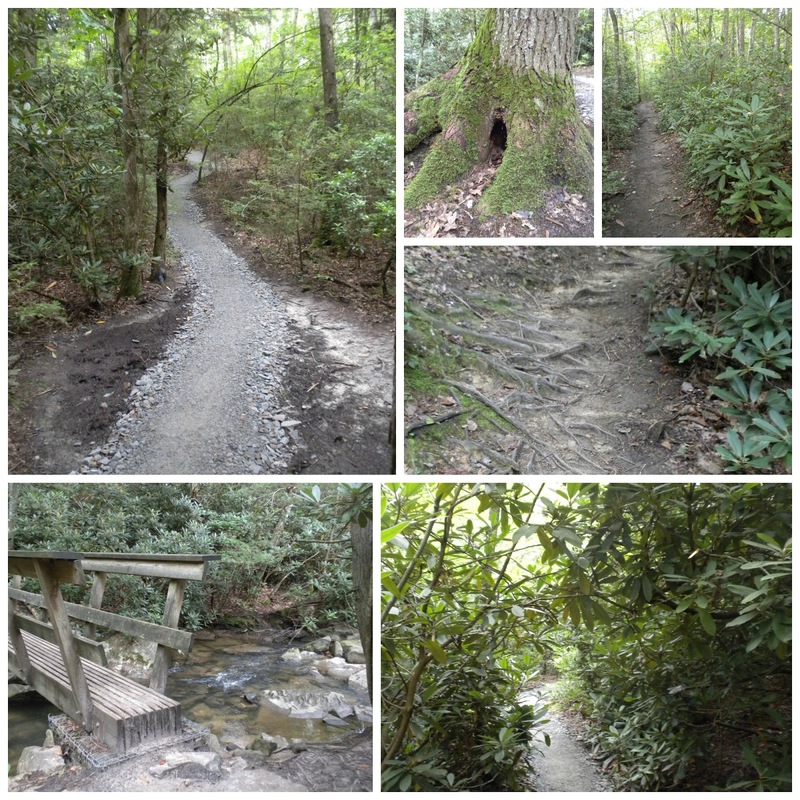 The trail is designated as a moderate hike, 2.4 miles that passes "through rich forest, crosses Fern Creek, then zig-zags along the cliff edge." We worked our way to various points at the peak, rewarded with views of the New River from several ledges. 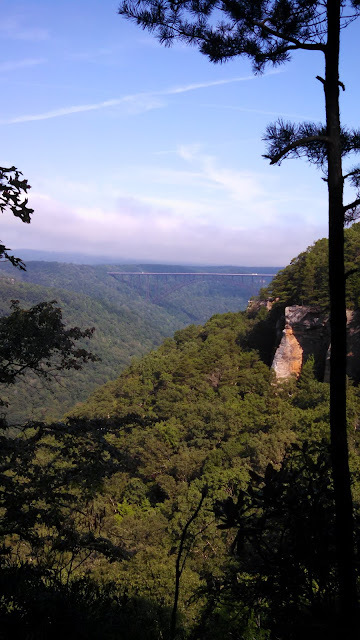 The most notorious of the ledges on the Endless Wall Trail is Diamond Point. 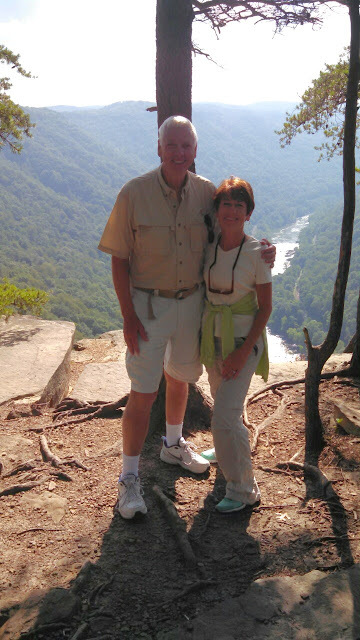 We met another couple when we reached Diamond Point, and we exchanged the favor of photo ops for each other. Although the fog was still burning off and the sun wasn't quite high enough to make for optimal photographs, we were still able to capture a pretty good look at the New River Bridge from our vantage point. Later, we would see Diamond Point from the bridge's catwalk. Off the trail by 11am, we headed into town less than two miles aways for lunch at the Secret Sandwich Society in Fayetteville. Catering to hungry outdoor enthusiasts as well as indoor business clientele, we chose a couple of sandwiches from the menu, all named after historical political figures and presidents. Mr. P. got the Lincoln, "exercising his freedom of choice" for meat, cheese, and sandwich spread. 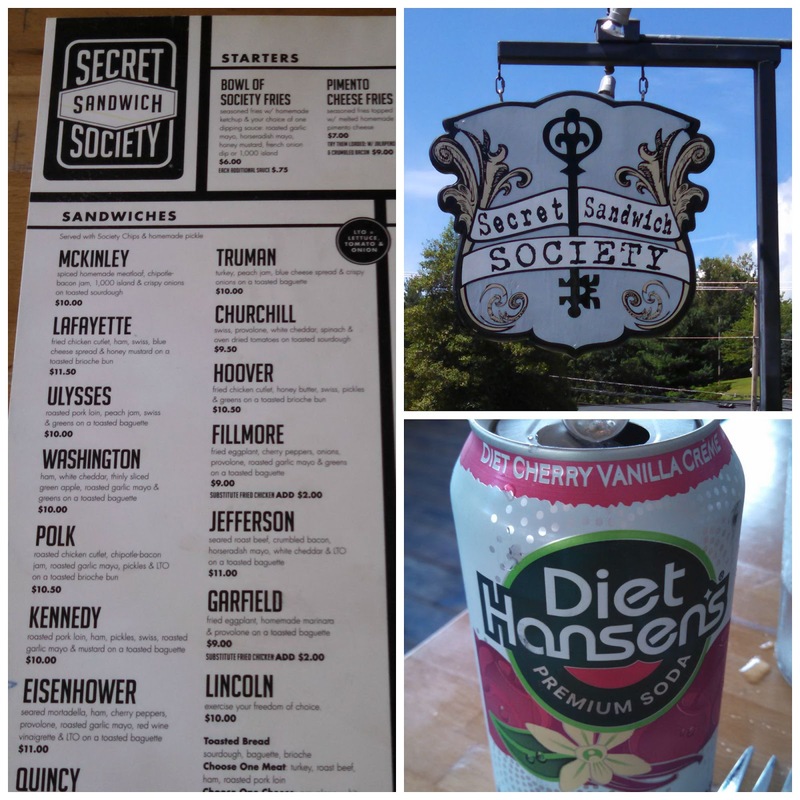 I got the McKinley (meatloaf with a chipotle-bacon jam, 1000 island, and crispy onions on sourdough), with a Hansen's diet cherry vanilla creme soda - so good! We both enjoyed our lunch fare. Without much time to waste, we next headed back to the adventure-central area of Fayetteville for our afternoon excursion, the BridgeWalk. There were twelve in our group, with folks from New Hampshire, Pennsylvania (Pittsburgh), and Ohio (Cincinnati). We were considered locals, and our guide was was pre-med college student from the area. I'm not gonna lie, the walk was intense, especially when our guide would step out onto the crossbeams and stop to tell us cool facts. Four lanes of highway traffic zoomed overhead, while the river below us was paralleled on either side with railroad tracks, on which coals trains rumbled by repeatedly. In the photo above, (left side), you can see the bridge that preceded the New River Gorge single-span, steel bridge. Navigating and accessing the previous bridge was via a hairpin-curved, country road. Completion of the New River Gorge bridge in 1977 opened a huge tourist industry of whitewater rafting (rafts, appearing as a dotted line, are visible in the bottom right portion of the photo above). Below is a view of the Diamond point ledge we hiked to that same morning, on which we had our photo taken by another couple we met there. 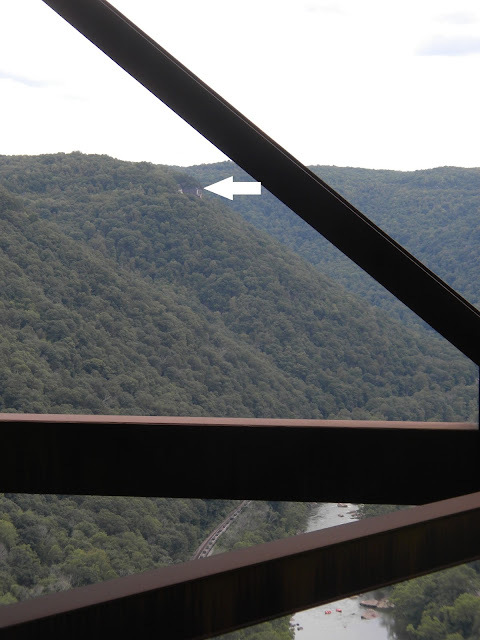 The white arrow points to the Diamond Point ledge, as viewed from the catwalk on the New River Bridge. The bridgewalk was invigorating, albeit a little tense for me. We were tethered onto cables above by a simple lanyard strap and clips. The bridge is 3,030 feet long, and is the second largest single span steel arch in the Western hemisphere, and the highest vehicular bridge in the US at 875' (facts, as of this writing). We finished the trip in just under two hours, and made our way back home by late afternoon. A great day! 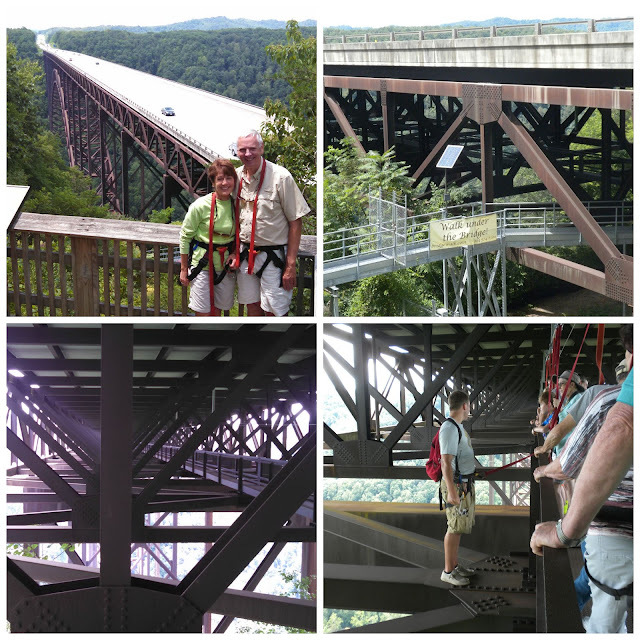 Every year since 1979, the New River Gorge bridge is host to Bridge Day, held the third Saturday of every October, now in its 36th year. Base jumpers literally catapult off the center of the bridge, parachuting from its peak height of 875' at the bridge's center. It is the only day of the year where this is allowed, and the bridge is closed to vehicle traffic. Rappellers are also allowed to go off the bridge that day, along various points. It is a tourist event, with as many as 20,000 people descending upon this sleepy town, creating a festival atmosphere. The night we returned home from the New River Gorge National Park, a local professional photographer, Steve Shaluta, happened to be at the national park, seeking photo ops of the perseid meteor shower. With his permission, I am sharing this stunning photograph he took between 2-3am that night. 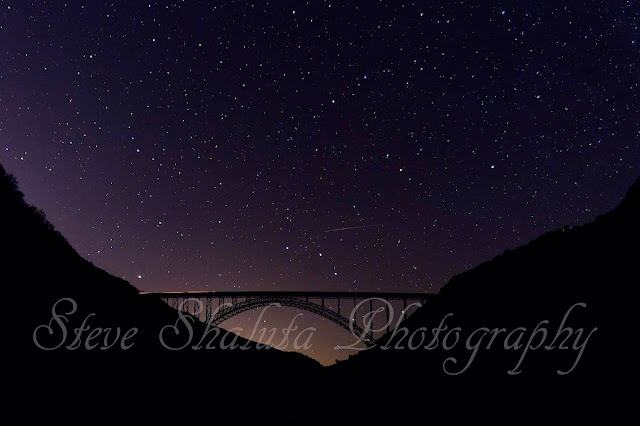 You can see one meteor, just above and near center of the bridge's arch. To view more of Steve's gorgeous photography, click on his name, which will take you to his website. Voted one of the "Top 10 Coolest Towns in America" by Budget Travel Magazine, Fayetteville, WV has a population of less than 3,000. As small as the town is, though, it's pretty much put WV on the map as far as tourism is concerned, thanks to the New River Bridge. In 2005, the New River Bridge image was voted by residents to be featured on our state quarter. I hope you enjoyed the recount of our trip. If you ever get the chance, you really should try to visit this golden nugget in our Wild, Wonderful West Virginia. Several links are embedded within here, which will provide information on the places mentioned. 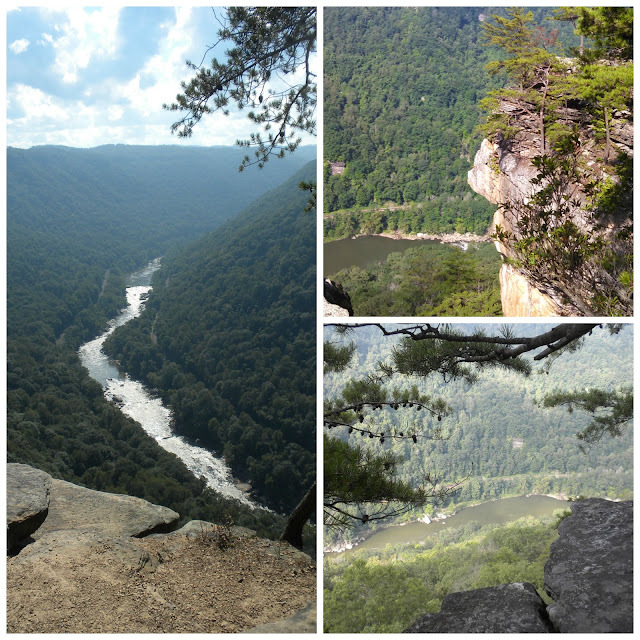 You can also check out our state's tourism site, Go to WV, for a free travel and much more. Thanks for coming along! Whew! We've been doing the two-step shuffle in our Panoply booth spaces since my Summer Booth Transitions update just a month or so ago. 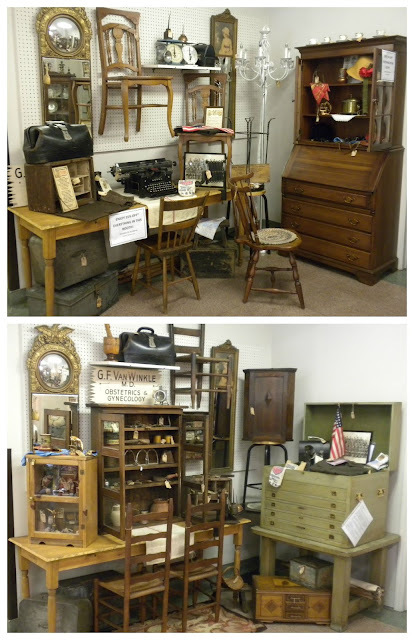 Several furniture items sold, and other things were brought in, while existing inventory got moved around - like a maze!. We (as in sister M) did particularly well with our anniversary sale the first weekend of August. This is a recap of the booth maze craze (lots of photos!). Our latest vignette includes some of the finds from the 2015 Longest Yard Sale Results. Sister M scored that great, old slant desk, and sister J, being the patron saint of old chairs, came home with a couple, one of which is the plank in the photo above. Some other items rounding out the school daze vignette include some already on hand: the map, bell, and globe. Others acquired on the LYS include the Victorian pencil box and late 1920s-early 1930s classroom photo. It's even hard for me to keep track of our booth space maze, so I certainly don't expect my readers to, but I'll try to point out key moves. 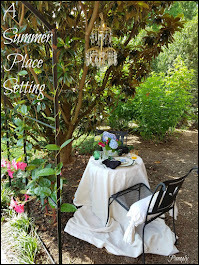 The area immediately in front of the corner wall / nook pictured above is where we had our summertime theme. 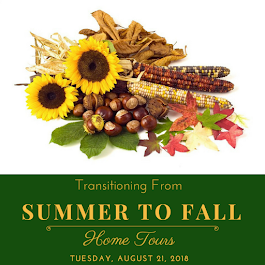 We had just set our first glimpse of fall on August 4th with a table setting and four ladderback chairs (the ones I enabled sister J with from that June estate sale spree I went to), and the table sold the next day! So, here we are at mid-August, with a mix of primitive and vintage utility items. The same space from June through August, in all its transitions. The area we called the encampment also saw a lot of changes, as both furniture and smalls sold. Here's how the space currently looks, as set in mid-August (photo below). Of note, the corner walnut cabinet and 5-shelf primitive tabletop cabinet on the table's center, plus two of the ladderbacks, landed here. The chair on the wall came from the LYS (all the chairs previously in this space sold). The jewelry cabinet on the far right replaced a large secretary that sold. Below is the before & after of that same space. 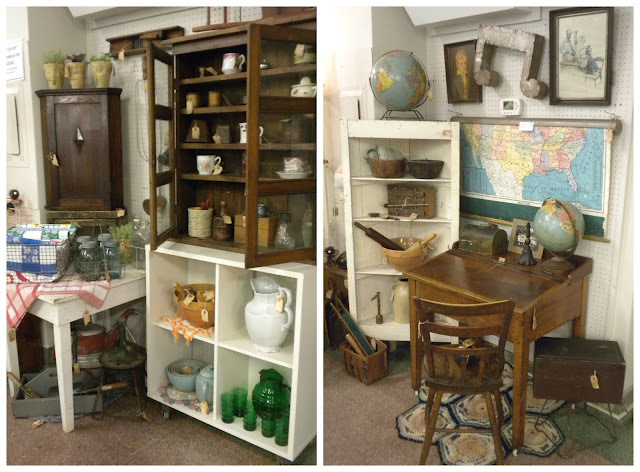 The area across the aisle had a china cabinet that sold in July, so here's a shot of the before & after of that space (photo below). 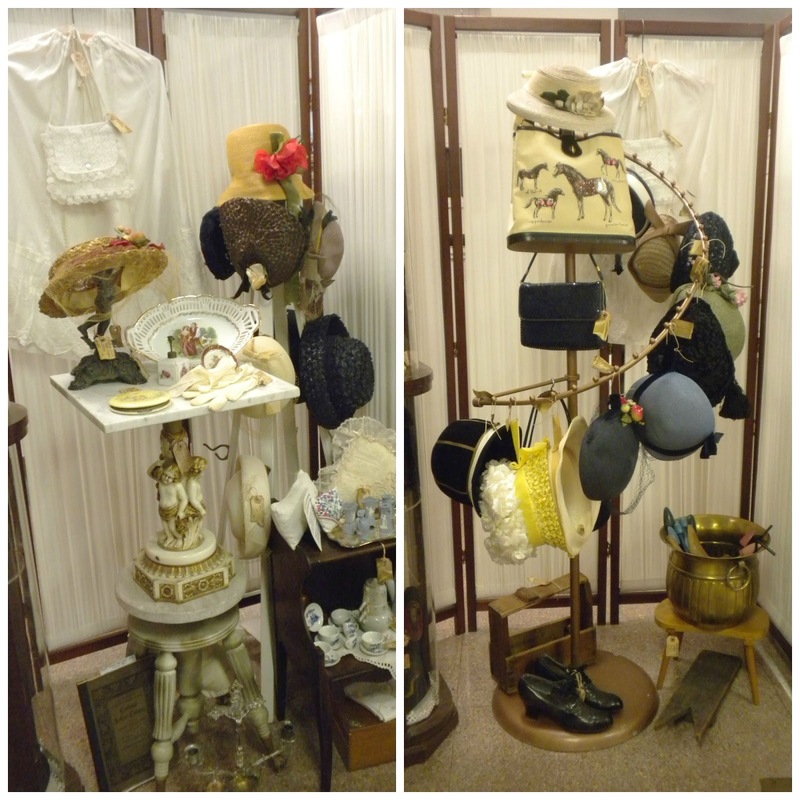 Of note, everything in the china cabinet found its way to the bookcase, and all the hats in the bookcase are on a rack on the aisle (far right of bottom half of photo). 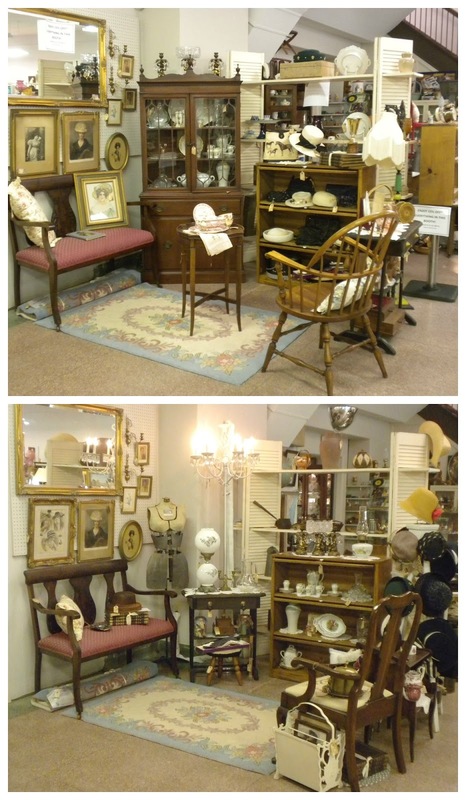 The windsor chair and floor lamp also sold (top half, right side). The chandelier was moved from its holding place in the encampment, and the mannequin beside was just added. In the photo above, you see the shelf divider we have (made of boards and shutters) right behind the bookcase, and the school daze vignette is on the other side of it. On the shelves previously, we had several small items which ended up being put "out to pasture". Tired of looking at it all, we wrapped most of it up for either yard sale or storage, and changed the look. The shelf divider is now geared toward many of our primitive tools, crocks, and other utilitarian items. At the left edge, on the aisle, is our hardware corner (see below). The light color and number of shelves make it a lot easier to rummage through the primitive items, which are, by nature, dark, and were previously in various crates, mostly sitting on the floor (hard to get to for many). All of this brings us back to what we call our main booth. It's a little less cluttered, as we removed the hardware from here (which never really fit). 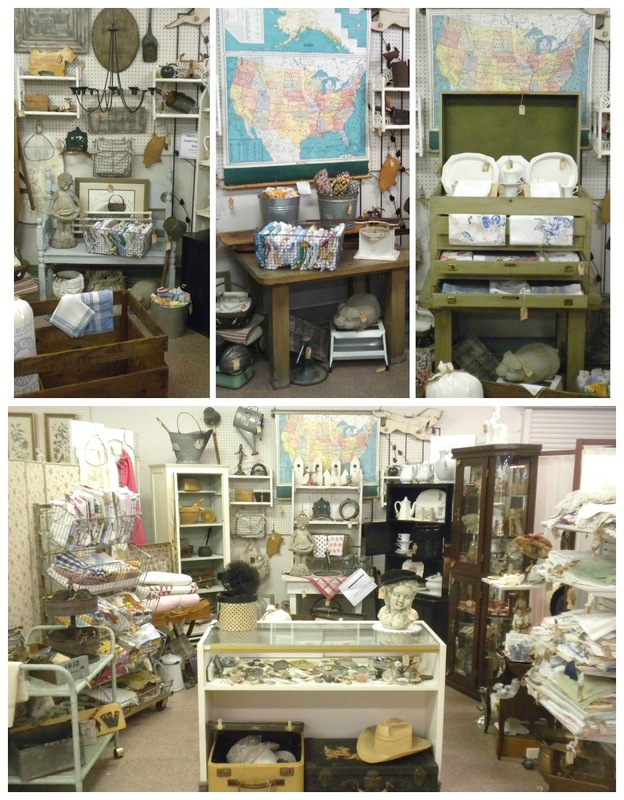 It's still full of linens, hats, and farmhouse vintage goodies. On the right side of the booth space, we ended up with a new (old) spiral clothing rack from a dealer who moved out at the end of July. On the rack, we're displaying half of the vintage hats sister M stocks. The photo below is the before & after appearance of that section, in which all of the before items (left side of photo) are now in the space with the settee (as noted in the bottom portion of the formal space photo earlier in this post). For those of us in the vintage resale business, it's a real accomplishment to continually refresh our spaces in the hopes of keeping customers interested (and buying). We can (and did!) a major furniture move the first week of August in just under one hour, yet mid-August changes with shelves and cubbies took us nearly five hours to complete. 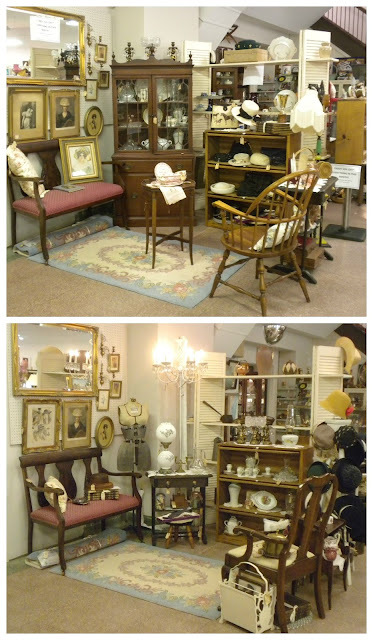 This did not include our standing curio and floor cases, which we might spend an entire session restyling. 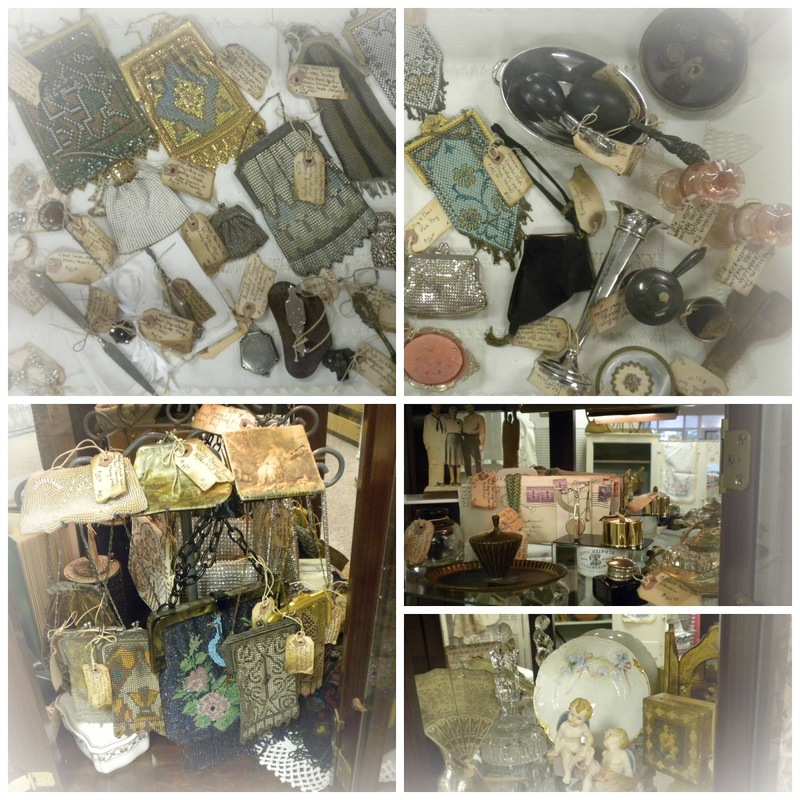 The photo below is just a sampling of what's in the cases. Our goal is to try to make tags visible so customers can see prices without the need for a salesperson. It's how we would want to see things if we were shopping. Believe it or not, moving the big items is, most of the time, less taxing than changing / moving smalls. In all the photos captured here, the number of small vignettes changed were simply too many to comment on. 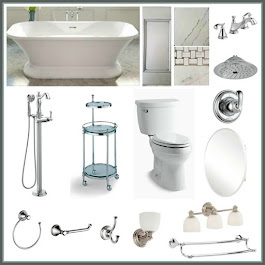 I realize some bloggers will create an entire post on a new vignette within their home, and I get that - totally. It takes time to visualize what look you want, choose or curate the items for display, and then execute the idea. Panoply is fortunate in that there are three of us buying - individually - with complementary styles and ideas. We make a lot of changes, so I'm inclined to pen a post after a number of the vignettes and spaces get changed and/or moved, versus just one or two. For me to document all the "befores and afters" from a macro view really helps us, retrospectively, in terms of reviewing what worked, what didn't, and keeping the out-of-town sister in the loop. Journaling all of these changes is the crux of why I started blogging. I appreciate all of you who've danced with me on this two-step shuffle of our latest booth maze craze. It's fun to share to with you. If you have any questions, or want more information on anything seen here, feel free to email me (there's an email link on my sidebar where it says "note"). Before you get all excited to hear about Panoply's adventures through the Longest Yard Sale, let me just preface my recount of events by saying we left plenty out there for others to rummage through and score, yet we came home with two trunks full. It rained on our trip over to KY and OH on Thursday, and our plan B of shopping in our favorite haunts that day was a no-brainer. We ran into several dealers who mentioned AL and TN as great territory for the Route 127 sale, but stories of people getting stuck in muddy, open fields certainly curbed my jealousy for whatever missed opportunities there may have been there. Some of my finds from our ventures this past weekend included vintage textiles: a hand-stitched star quilt, a couple vintage tablecloths, and set of vintage napkins. Anytime Mr. P. says he likes something, it's likely a keeper. He likes the quilt. I have an idea for the quilt - stay tuned. I also came across this chippy, rusty vintage sled, which will serve its purpose closer to Christmas. On Friday, we did venture out to the open markets during the morning hours, and I came across this delightful gentleman pictured below, a retired factory worker from OH, who created MObots (mechanical object bots). His name was Mike O'Shea, (MO), so he cleverly incorporated his initials into his craft. I purchased the MObot in his right hand you see in the photo above. He was named "Homer" because, as Mike put it, "he just looks like a guy who works hard, and had a long day, and was on his way home from work". 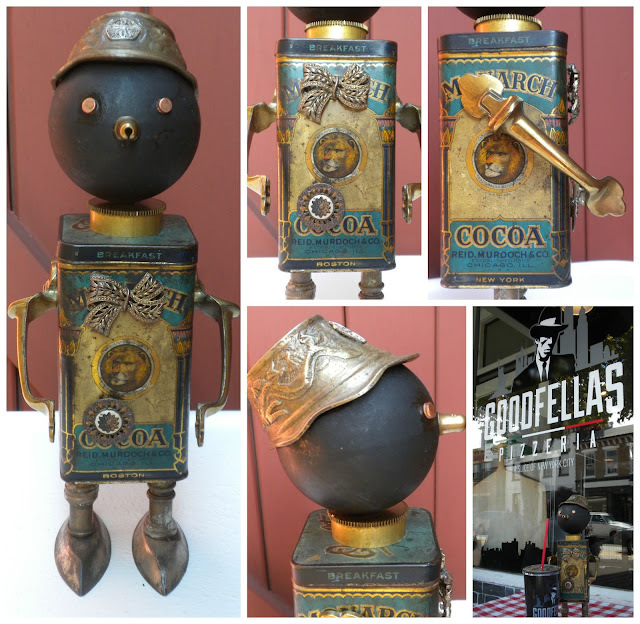 :) Homer is made from a cocoa tin, a copper ball head, solid brass cap/cup, along with brass nuts/bolts legs and drawer pull arms. He's embellished with a few odd pieces of jewelry. Homer stopped to have lunch with us at a quaint pizzeria that day (see photo details below). I also found this super clean set of scales with porcelain trays from an older gentleman and his wife of 51 years (photo below). The scales came with an assortment of boxed scale weights, not pictured. I placed the scales on a utility cart I found at an estate sale in June for my photo. It's a little different from most because of its petite size, plus it has three shelf surfaces instead of the usual two. I like the scales alone, but I like the way the scales look on the cart. The cart's going to the booth, the scales will be fostered for a while. After a morning of outdoor efforts along the 127 Longest Yard Sale, we decided again to hit another of our favorite haunts. We felt no shame in our plan, as none of us felt like filtering through lots of clothes and baby paraphernalia in hopes of finding a honey hole for pickin'. There were lots of clothes and baby paraphernalia along the way. I came across two great, little finds to satisfy a couple of my quirky collections. The first is the photo below, a rare one, of two little girls at the turn of the 20th century (obviously sisters), the oldest carrying a purse! You can read about this facet of my purse collectibles in the post, Crossover Collectible: Purse Ephemera, here on my blog. The second quirky item I found was a miniature book (3" x 2.5") titled, "Daily Food". 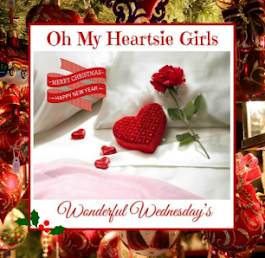 It's 192 pages of daily scriptural portions, together with the verse of a hymn, for each day of the year. These miniature books are so hard to find without monitoring eBay, so I was especially excited to find it, and the price was right. It will be a nice addition (and edition) to my Miniature Books. There were several other small items found on this trip. One was a vintage hat box (photo below). I will always pick these up when I find them in good vintage condition (if at a good price), as they are more unusual in shape, and they display well. The leather handle is in particularly good condition. Now here's an item I've never seen before that immediately caught my eye. It is one of three finds I picked on this trip, pictured below. Can you guess which one it is I favor? If you guessed the one on the right, you are correct. 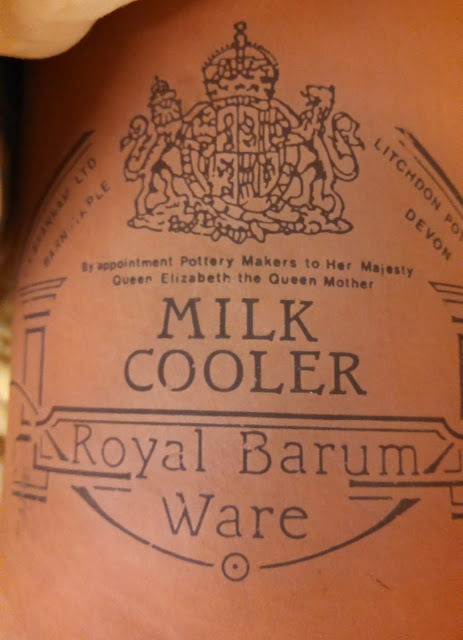 It is a terra cotta milk cooler, and it fits over a pint size milk bottle. Above, you see the milk bottle (Newark, OH), and below, you don't. It's designed for table use, to keep your milk cold. The detail on the cooler indicates it is Royal Barum Ware, made in Litchdon Potteries, Devon (England). It reads, "By appointment Pottery Makers to Her Majesty Queen Elizabeth the Queen Mother". It may not be old or even vintage, but it's a very cool cooler, if you ask me. I also had to plan for returning home with the fire chief pedal car that we spotted on our June Panoply shopping trip. My sister picked that up for me after my phone purchase, and stored it this past month for my son-in-law. After the car was packed, it was full, but still manageable for driving visibility. This was one of two SUV carloads we managed to purchase, organize and wrap. 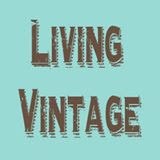 When vintage shopping, junkin', thrifting, pickin' - whatever you label it - one never knows if the stars will align for the perfect pick: money in hand, lots of unique treasures for personal gathering and/or resale, and the right price. I'd say we fared well enough, and we had our share of fun, but it wasn't a stellar shopping event. My sister, M, came away with a super old desk (it's at the bottom of that SUV pile above), so we'll be setting a new vignette very soon in the store. I'll share those photos as soon as the vignette is set. 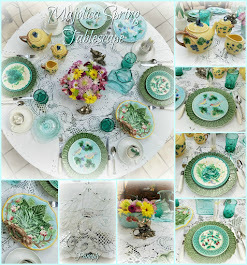 I know a couple of blogging buddies also traveled the Route 127 Longest Yard Sale, and it would appear from Facebook and Instagram that they succeeded in the open air hunt. 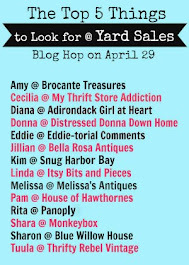 Check out Linda at Coastal Charm and Melissa at Melissa's Antiques for their takes on the Longest Yard Sale. Linda started from AL and Melissa started in OH and went north to MI Route 12 for its piggyback version of the longest garage sale. 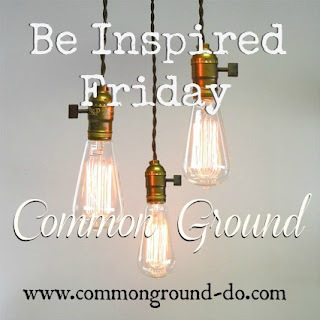 Where have you been lately in your quest for fun, vintage finds? As always, thanks for your visit. It's a pleasure to have you here! I grow my own lavender as a perennial, and use it primarily for sachets that my Panoply sister, M, fashions out of vintage textiles and buttons. 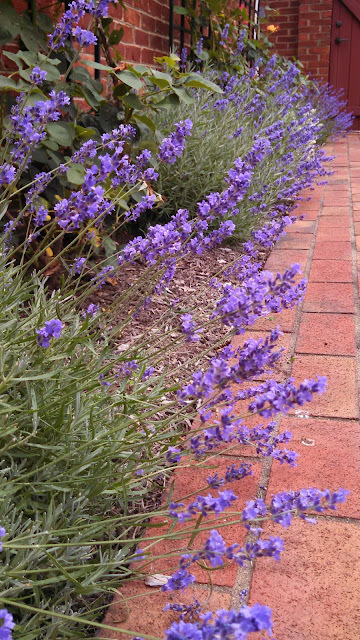 Lavender is fairly easy to grow, but requires good drainage and good sun exposure. Most of my lavender plants are planted on slightly mounded dirt, rooted at the base of my climbing roses, against a brick wall with southwest sun exposure. The space is also totally enclosed (a courtyard), where the plants are somewhat sheltered from strong winds in winter (we have all four seasons in my region). Just after winter, though, the plants can look pretty scruffy, even up until April in my Zone 7a region. By early June, however, the plants are sending out their buds, the perfect time to harvest them (before the bloom opens). Cutting the lavender is time-consuming, as each plant needs a visual look-see to determine which stems are best for cutting in order to dry. It's a good piddling activity in the garden. I usually cut the center stems first, down to the first juncture of outliers on either side of the center stem. I remove any leaves by holding the stem between my thumb and index finger and shearing the stem. Those outlying stems will grow for a later cut, a week or two later. After the "bouquets" are cut, I trim the ends and either tie them with garden string or bind them with a rubber band. The rubber band is actually better, as it will contract as the bouquet is drying and shrinking. I then hang the bouquets upside down in my sunroom to completely dry out (on S hooks). 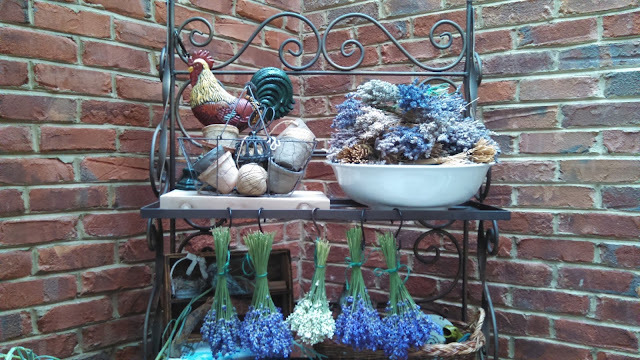 As you can see from the photo below, the stacks of lavender bouquets were already piled high in the antique wash basin. That basin shows nearly two years' worth of harvest from my row of 8 or 9 plants in the courtyard. I finally got around to shucking all the buds off of the stems recently. Mr. P. is highly sensitive to anything with fragrance, so I started outside on a day when it wasn't windy and wasn't raining (a rarity in June and July this year). The air was ideally calm, but it was too hot, so I went to the basement to finish the job. It took me nearly 2 hours to finish the totally manual job. I thought I had a brilliant idea of using an old colander and placing the stems in the holes to pull through and facilitate the job of shucking, but it ultimately didn't work well enough to keep doing it beyond a few stems. 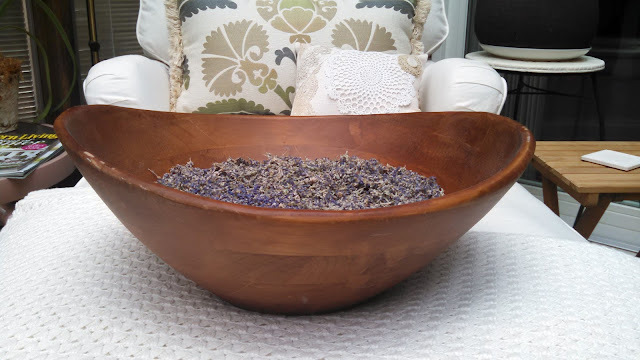 When completed, I had this wooden bowl nearly 3" deep and 11" across full of lavender buds. I still had this year's harvest remaining, leaving it for the time being, in case I want to use the bouquets for decoration throughout the house. There are lots of uses for lavender - soaps, water spritz for linens, lavender wands, sachets - the list goes on. 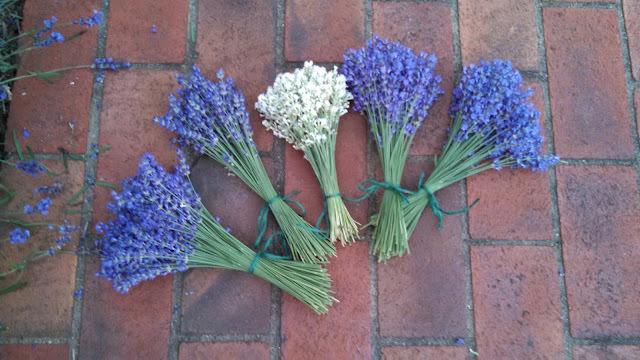 I previously wrote a post on a few crafts and recipes using lavender, which you may want to refer to and/or pin. 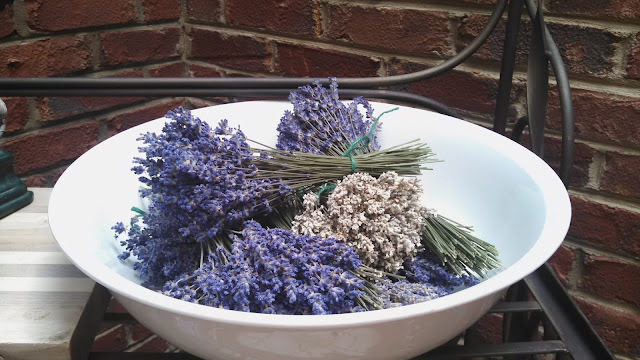 Lavender is the only herb I grow currently, but I have grown Italian herbs in the past. 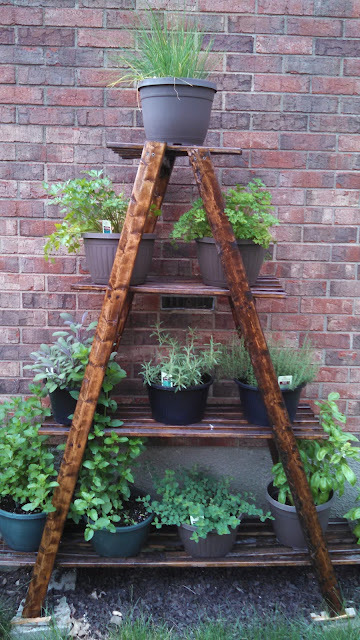 While visiting my Panoply sister J in Cincinnati in June (both Panoply sisters also grow lavender), I snapped a photo of her husband's herb garden ladder, all of which they harvest for use in cooking. Doesn't that herb garden look wonderful ?! J's husband made the ladder, and it's tucked away on the side of the house, separate from their fenced-in vegetable garden. The herb ladder is positioned close by the kitchen door. They're growing chives, parsley, cilantro, basil, oregano, sage, and rosemary (and maybe dill, I can't recall). It makes me want to start my own herb garden again. J's lavender plants are in yet another area of their yard, apart from these herbs and their vegetable garden. They are part of her landscape, but I didn't photograph that section. Do you grow your own herbs? If so, do you plant them in a bed or containers? As always, thank you for your visit. It's a pleasure to have you here!